I will be going into my army choice in some detail, though that will have to wait until God of Battles is closer to coming out. For now, the broad strokes are that I’ve picked a minimal sized army with none of the frills. 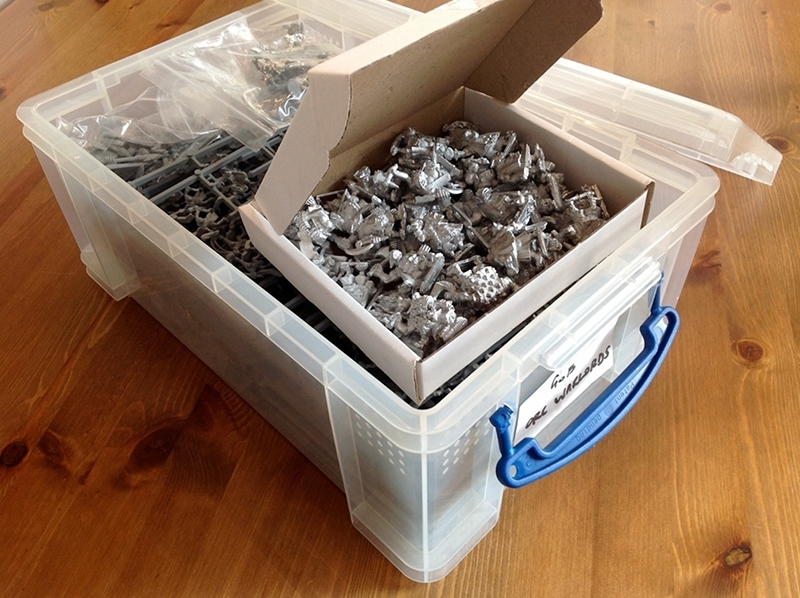 This allows me to focus on the core troops needed and get an army sorted and onto the tabletop in the shortest time. Adding fancy bits will be fun later. Even with the minimum army size there are a number of different approaches you can use to select your force. In this case I’ve concentrated on the real basics: 2 units of orc warriors to thump folk, a couple of units of goblin rabble to back them up and two mobs of goblin pests to stick the opposition with arrows while the rest advance. Six units then: two of orcs and four of goblins. That will give me a solid basis to expand the army later. Having decided on this army, I rummaged in the box I’d been collecting models in for just such an occasion. I’m sure that I’m not alone in collecting things for future projects. In this case I already had a box labelled up into which I’d been putting the occasional purchase over the years. This photo is me laying out some models to check I’ve got the right sorts of numbers and don’t need to rush off and buy any more. 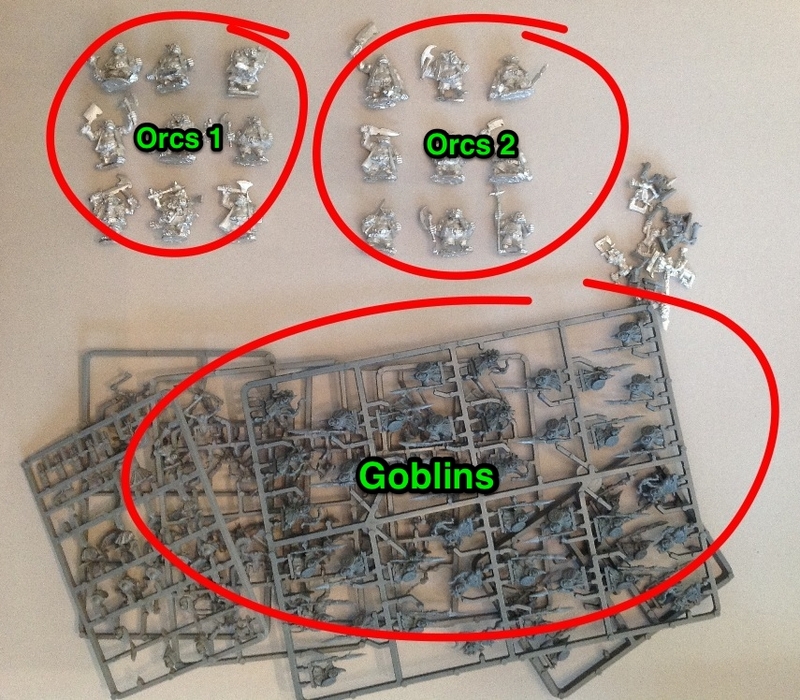 I’ve actually got a lot more than this, so there are plenty of options for the Orcs. Looks like I won’t need to do too many conversions to get my desired lack of duplicates. That’ll speed things up nicely. The goblins in the photo are mostly GW ones as I’ve mislaid the Mantic ones I had who will be joining them. Can’t trust a goblin to be where he’s supposed to. Typical. Anyway, there are a lot more to add to the mix here, which already includes several generations of GW greenskins of the smaller variety. There are a handful of Foundry gobbos to come as well. However, my main interest here was to check I was on the right track in terms of numbers (which I am), and then I’ll be starting with the orcs. I have rather more chopping about planned for the little greenskins. I was able to break out my Mantic Undead I’ve had lying around since they came out to make one of my two armies. They mapped across perfectly to give the same size of force and have just gone under the paintbrush. Orc’s & Goblins are truly the “Jazz” of the wargaming world. It seems that no matter where you start, you’ll always end up there tinkering with a force that can never truly be mastered. I used to have the old Citadel Orc rock band, but I don’t think I’ve seen the greenskins jazz quartet yet. Can we expect that from you in the next wave of figures? Its tempting, it really is! Do tell more about God of Battles !! Your starting an army! Hooray! This is so exciting. It’s going to be so, so epic. Good luck and godspeed. Happy painting to you!